Tickets Now Available For Harlem EatUp! NEW YORK -- Harlem EatUp! festival co-founders Marcus Samuelsson and Herb Karlitz announced that tickets are on sale for the third annual festival by visiting www.harlemeatup.com. 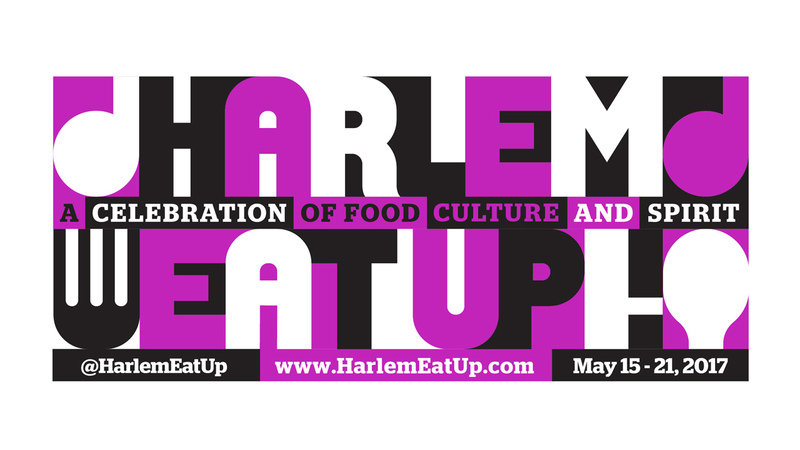 Taking place May 18 - 21, 2017, Harlem EatUp! is a celebration of Harlem's rich culture, art and rapidly growing culinary scene. The four-day festival will take place throughout the neighborhood, with events that include Dine-Ins at some of Harlem's restaurants featuring guest chefs, and a two-day outdoor Grand Tasting at Morningside Park, one of the neighborhood's most celebrated parks. Among the many restaurants to be featured this year include: BLVD Bistro, Chaiwali, Harlem Shake, Vinateria LoLo's Seafood Shack, Melba's, Minton's, Red Rooster, Tastings Social presents Mountain Bird, and more. Additional festival programming, participating chefs and restaurants will be announced throughout the spring. "The Harlem EatUp! Festival is inspired by the vibrancy of the Harlem community and all that it encompasses: music, art, people and of course, food," said Chef, Restaurateur and Co-Founder of Harlem EatUp!, Marcus Samuelsson. "Harlem EatUp! is a week-long celebration of food, art, music and culture, highlighting local businesses, restaurants and artisans. If you haven't danced in the tents in Morningside Park yet and sampled some of the city's best food and drink, we hope to see you this year!" As part of its mission and dedication to Harlem, the festival's net proceeds will be donated to Harlem Park to Park and Citymeals-on-Wheels. These donations will be disbursed by the newly formed Harlem EatUp! Foundation, whose mission is to strengthen community by supporting the people, cultures and non-profit organizations that empower Harlem. "Harlem EatUp! week is a coming together to celebrate Harlem," said Herb Karlitz, Co-Founder of Harlem EatUp! and President of Karlitz & Company. "We are so excited to have our founding sponsors back and so many of our local Harlem restaurants joining for year three." Kicking off the festivities again this year is the always anticipated Dine-In Harlem Series, where for one night only, Friday, May 19, an array of Harlem restaurants and chefs will host acclaimed chefs from NYC and across the country to collaborate on multi-course menus that showcase the unique feel of Harlem's landscape. Menus will be paired with wines from the Bordeaux Wine Council, and each dinner will feature dynamic Harlem artists and performers, making Dine In Harlem one of the biggest multi-room dinner parties this season. Some of these collaborative dinners include: Minton's, hosted by chef Joseph "JJ" Johnson; Streetbird, hosted by chef Aja McWilliams with guest chefs from Four J Foods: Jimmy Bradley, Joey Campanaro, Jonathan Waxman and Jason Giagrande; Mountain Bird, presented by Tasting Social hosted by chef Kenichi Tajima with guest chef Laurent Tourondel; Vinateria, hosted by chef Yvette Leeper-Bueno; Chaiwali hosted by Anita Trehan and guest chef Daniel Holzman from the Meatball Shop; Lolo's Seafood Shack hosted by Leticia Sk Young and Chef Raymond Zamanta Mohan along with guest chef Dale Talde; and Ginny's hosted by Marcus Samuelsson with guest chef and artist Roger Mooking and chef Alex Becker Kuro of Seminole Hard Rock. The 2017 Harlem EatUp! Festival will be made possible, in part, by Founding Sponsor, Citi; and Platinum Sponsors: Aetna, Bordeaux Wine Council, EY and Macy's. A full list of Festival sponsors is below. Tickets are available for purchase starting March 24, 2017, and you can view free activities at www.HarlemEatUp.com. Additional festival programming announcements will be made throughout the spring. Please visit www.HarlemEatUp.com for more information. The third annual Harlem EatUp! festival, taking place in Harlem, New York, celebrates the food, culture and spirit of Harlem from Thursday, May 18 through Sunday, May 21, 2017. This highly anticipated weekend festival represents the spirit of Harlem while paying homage to its roots. Founded by award-winning chef and cookbook author Marcus Samuelsson and Herb Karlitz, President of the event marketing firm, Karlitz & Company, Harlem EatUp! is committed to highlighting the distinct culinary experiences, music, history, culture and art of Harlem. A variety of events, both free and ticketed, will be held throughout the weekend. Citymeals on Wheels (citymeals.org) provides a continuous lifeline of nourishing meals and vital companionship to New York City's homebound elderly. Working in partnership with community-based organizations and senior centers, Citymeals prepares and delivers over 2 million weekend, holiday and emergency meals for more than 18,000 of our frail aged neighbors each year. Last year, over 15,000 individuals volunteered nearly 72,000 hours of their time. Since its founding in 1981, Citymeals has relied on the generosity of its Board of Directors, the City of New York, sponsors and other designated gifts to cover administrative costs. This ensures that 100% of all public donations will be used entirely for the preparation and delivery of meals. Harlem Park to Park (HP2P) is a neighborhood development organization of entrepreneurs committed to cultural preservation, small business and community development in Central Harlem, NYC's premiere cultural, dining, shopping, lifestyle and nightlife hub north of 110th Street. Formed in September 2009, HP2P's membership is comprised of 130+ premiere businesses located within the geographic area of Central Park North to 144th street and Morningside Park to Marcus Garvey Park. Our mission is to encourage commerce that successfully sustains small businesses; promotes the community and culture of the Village of Harlem and celebrates the neighborhood's historic CHARM. The Clinton Foundation convenes businesses, governments, NGOs, and individuals to improve global health and wellness, increase opportunity for girls and women, reduce childhood obesity, create economic opportunity and growth, and help communities address the effects of climate change. Because of our work, more than 35,000 American schools have provided kids with healthy food choices in an effort to eradicate childhood obesity; more than 150,000 farmers in Malawi, Rwanda, and Tanzania are benefiting from climate-smart agronomic training, higher yields, and increased market access; working with partners, more than 8.5 million trees and tree seedlings have been planted to strengthen ecosystems and livelihoods; over 600,000 people have been impacted through market opportunities created by social enterprises and health and well-being programs in Latin America, the Caribbean, Asia, and Africa; through the independent Clinton Health Access Initiative, more than 11.5 million people in more than 70 countries have access to CHAI-negotiated prices for HIV/AIDS medications; an estimated 85 million people in the U.S. will be reached through strategic health partnerships developed across industry sectors at both the local and national level; and members of the Clinton Global Initiative community have made more than 3,600 Commitments to Action, which have improved the lives of over 435 million people in more than 180 countries. Citi, the leading global bank, has approximately 200 million customer accounts and does business in more than 160 countries and jurisdictions. Citi provides consumers, corporations, governments and institutions with a broad range of financial products and services, including consumer banking and credit, corporate and investment banking, securities brokerage, transactions services and wealth management. Blog: http://blog.citigroup.com | Facebook: www.facebook.com/citi | LinkedIn: www.linkedin.com/company/citi. Aetna is one of the nation's leading diversified health care benefits companies, serving an estimated 46.5 million people with information and resources to help them make better informed decisions about their health care. Aetna offers a broad range of traditional, voluntary and consumer-directed health insurance products and related services, including medical, pharmacy, dental, behavioral health, group life and disability plans, and medical management capabilities, Medicaid health care management services, workers' compensation administrative services and health information technology products and services. Aetna's customers include employer groups, individuals, college students, part-time and hourly workers, health plans, health care providers, governmental units, government-sponsored plans, labor groups and expatriates. For more information, see www.aetna.com and learn about how Aetna is helping to build a healthier world. @AetnaNews Bordeaux Wine Council The Bordeaux Wine Council, Conseil Interprofessionnel du Vin de Bordeaux (CIVB), was created in 1948 as the official inter-professional body representing the Bordeaux wine industry-winegrowers, négociants (merchants) and brokers. It has four main missions: marketing and promotion of Bordeaux wines, technical development, economic and statistical data collection and analysis (production and sales of Bordeaux wines worldwide) as well as the protection against counterfeiting of the Bordeaux wine brand and its diverse terroir. Macy's, the largest retail brand of Macy's, Inc. (NYSE:M), delivers fashion and affordable luxury to customers at approximately 734 locations in 45 states, the District of Columbia, Puerto Rico and Guam, as well as to customers in the U.S. and more than 100 international destinations through its leading online store at macys.com. Via its stores, e-commerce site, mobile and social platforms, Macy's offers distinctive assortments including the most desired family of exclusive and fashion brands for him, her and home. Macy's is known for such epic events as Macy's 4th of July Fireworks and the Macy's Thanksgiving Day Parade, as well as spectacular fashion shows, culinary events, flower shows and celebrity appearances. Macy's flagship stores -- including Herald Square in New York City, Union Square in San Francisco, State Street in Chicago, and Dadeland in Miami and South Coast Plaza in southern California -- are known internationally and are leading destinations for visitors. Building on a more than 150-year tradition, and with the collective support of customers and employees, Macy's helps strengthen communities by supporting local and national charities giving more than $69 million each year to help make a difference in the lives of our customers.